About Party Rentals R Us! My name Is Andre Martins, Owner of Party Rentals R Us an inflatable and party rentals company in Long Island NY. Me and my team will like to introduce our selves and offer our services to you, as we have done for over 10 years with a success, feel free to look us up online and check out what our community has to say about us. Party Rental R Us is your perfect local business partner to help you plan your next successful event, and here is why. Selection: Party Rentals R Us, Has the best selection of inflatables and non-inflatable games in the area. We have over 60 different inflatable games to choose from, we carry bounce houses, combo bounce houses, slides, water slides, obstacle courses, interactive games, The Toxic Meltdown, Rock Climbing Wall, dunk tanks, and tents, tables and chairs. There is something for everyone. From little toddlers, teenagers to adults. Safety: We are fully insured for up to 2 million dollars, for your peace of mind. Not only we’re fully insured, but our number one priority is safety, all our employees go through a vigorous and extended training before they go out and work on the field. We will secure all games with stakes or sand bags to avoid any incidents. We offer trained attendants to work your event, or if you prefer to use your own staff or volunteers, we will train them, so they can attend the event. Cleanliness: All our equipment is inspected, clean and sanitize after every event. 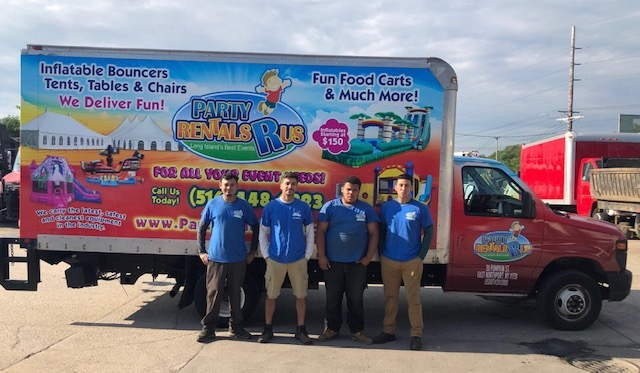 Here at Party Rentals R Us we take cleanliness very serious, we know there’s nothing worst than receiving a dirty or smelly bounce house for your child party or renting old equipment for your corporate event. That’s why we take the time to inspect, clean, and sanitize every piece of equipment after every use. We also replace all our equipment every two or three years to make sure we provide you with the news and latest equipment in the industry.